An honor box is basically a box filled with items meant to be bought on the honor system. 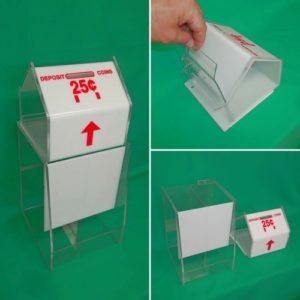 This is completely different from say, a candy vending machine or a soda vending machine in that no money is REQUIRED for the customer to receive their snack or candy. The customer will walk into an establishment such as a restaurant or bank and see a box on the counter. 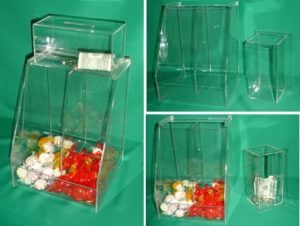 The box is open with candies in the tray, along with a slot to deposit money. The honor box can be made of different materials. 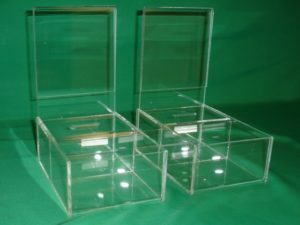 Some are made in a disposable manner consisting of cardboard while others of a more durable sort will be common Plexiglas. There are various designs and layouts, big and small, but the idea is the same. 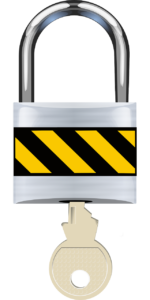 One added note on theft, if you use a charity with their stickers on the honor box, you will have a smaller percentage of theft in most cases. Some have even reported having more money than what they expected (less than 0% shrinkage – profit on top of expected profit). One great charity to contact is the NCCS, link to the NCCS Vending Program Here. If you can find a local charity to sponsor your boxes, it is even better. You pay nothing until the honor box is placed by yourself and accepted by the business. They usually do that to show their commitment to quality locations. The business owner or manager will be expecting you to show up with your brand new honor box or snack box. They confirm and qualify the locations for you. If for any reason there is an issue (rarely), it will be solved. They will resolve any problem you might have quickly because they care and want to be paid. So remember. If you want to save time, save your money (don’t pay anything until honor box is placed), and keep your business growing steadily. Call us with any question at 602 340 1236.